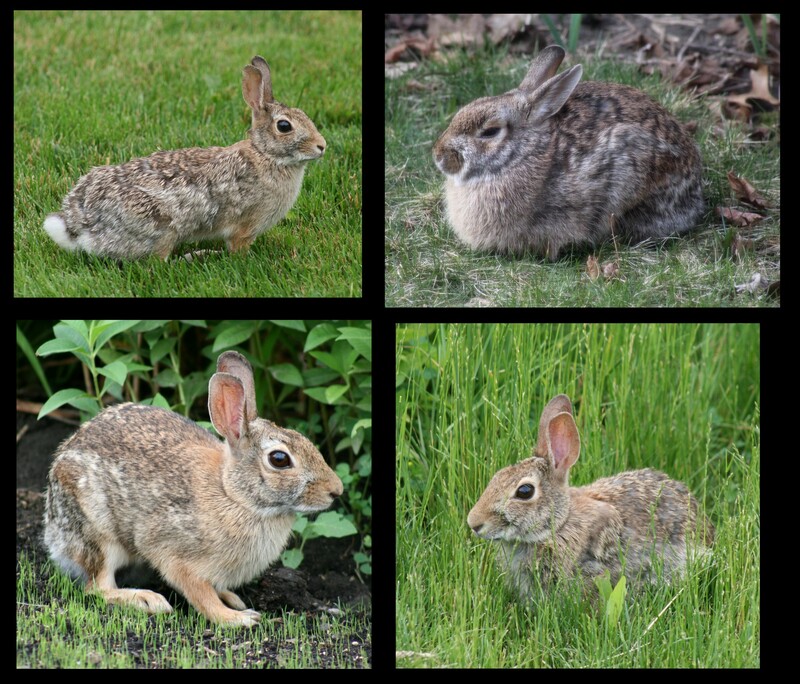 As I have had occasion to remark in previous posts, the wildlife in our neighborhood has a tendency to stand its ground when I go outside to take it to task for eating my best flowers or raiding the bird feeders. Nothing comes close to the cheek of the rabbit when we stare each other out over some tasty lily shoots, he looking as though butter wouldn’t melt in his mouth and me shaking my fist and muttering curses. But the squirrel comes a close second. Neither of them have any fear and their audaciousness knows no bounds. And you can add another critter to that list. 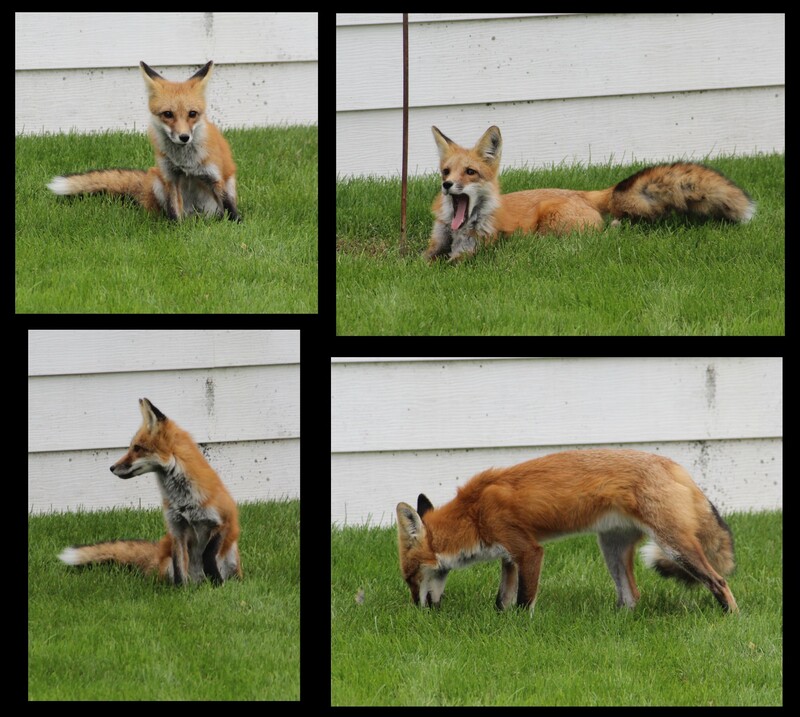 A few weeks ago we spotted this fox in a garden a few doors down. I was a bit cheeky myself and ran round to the neighbor’s back yard to get a closer shot with the camera. I didn’t think he’d mind (the neighbor, not the fox.) But then, apparently, neither did the fox. He just sat there, chowing down on some tasty morsel and watching me as I draped myself over the fence. My presence bothered him not one iota. Cheers to the rabbit and squirrel and a big Huzzah! to the fox – I’ve never seen one that close! Yes, I’d certainly miss them if they didn’t show up in the garden. The fox was definitely a bonus. We’ve seen them here before but not usually during the day and not making themselves quite so much at home. 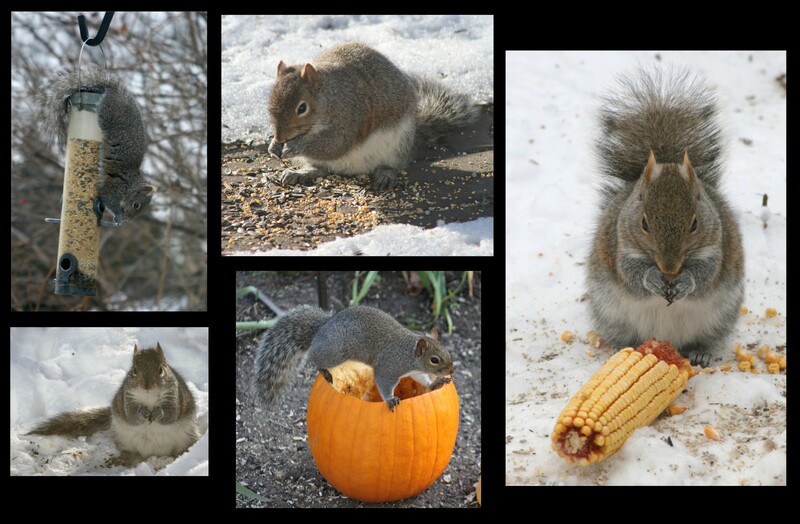 The squirrels are very entertaining and quite inventive. If only they weren’t quite so destructive. You seem to have great luck with animals. Usually, by the time I grab my phone, the critters gone. They don’t usually stick around that long which is why I was really surprised when the fox was still there after I went inside to find the camera. Probably a once-in-a-lifetime opportunity. Great photos of wonderful wildlife. I know they can all cause havoc in a garden but isn’t it great to see them free and enjoying themselves! Thanks, Lletty! Yes, I agree, it’s a blessing to be able to share the garden with these lovable creatures. I need to start carrying my camera around with me when I’m out in our yard/forest. I see the animals, but never manage to capture photos. These are fabulous; thanks for sharing. Thank you, Margo! I try to keep the camera handy for shots like this but there isn’t always time and some of the best opportunities have gone by, unrecorded. I don’t have a ‘smart phone’, but I sort of get why people like the idea of having a high res camera on hand at all times. Thank you! It’s true, if we wait long enough, all kinds of things show up on our own doorstep.